Residential reroofing: In the residential market for reroofing, the options are fairly straight forward. This includes removal and replacement of shingles, roll roofing, tile, wood, stone, metal, or other similar materials. It also includes the removal and replacement of the existing roofing and the installation of a different roofing material like metal panels, metal shingles, metal tiles, dimensional shingles, or other approved roofing material. Residential retrofitting: This includes the installation of a new second layer of shingle roofing over an existing shingle roof, which is allowed in many municipalities. This can also include the installation of a new material such as, metal panels, metal shingles, or other material over an existing shingle roof, roll roofing, or sloped built up roofing by furring above the existing material. Commercial and industrial reroofing: This is most common in the conventional flat roofing market, which includes built-up, single-ply, and tar and gravel roofing systems. These systems are simply removed, hauled off, largely discarded in landfills, and reinstalled with similar or like-kind materials. Metal roofing can be employed in this market, but it requires the construction of a structural framing system above the existing flat roof to create a pitched roof to which a new metal roof can be attached. This system can be invaluable for problematic roofs conditions and/or used to add aesthetics to an older, out-of-date building. In the case of an existing low-slope metal roof, it can be reroofed using a like-kind roofing material. This means a low-slope screwdown metal roof can be reroofed by removing the existing screwdown panels and installing new screwdown metal panels. A new standing-seam metal panel would not qualify to be installed unless the existing roof being removed was a standing-seam roof and the new roof was the same as the old one. 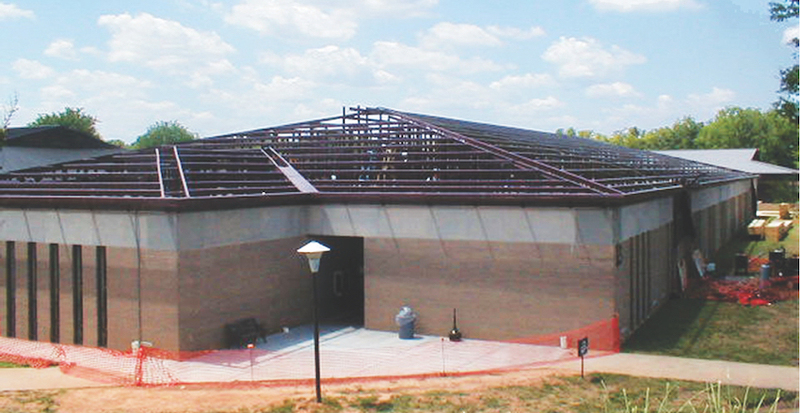 A technical college building reaps the benefits of a sloped, light-gauge, steel-framed retrofit over an existing flat roof and new standing-seam metal roof. Commercial and industrial retrofitting: Much of this market is low-slope roofing, the vast majority of which are metal roof systems. 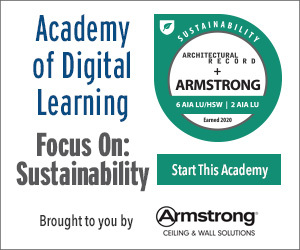 Typically this involves placing a sub-framing system over the existing roof panels and into the structural supports—purlins or joist beneath. The attachment of a new metal panels into the sub-framing system correctly transfers the roof loads to the existing structure. The sub-framing systems available include hat channel over hat channel, up slope cee or zee members with hats over, and notched zees that fit directly over the existing panel ribs. These systems are typically installed on the exterior of the building roof, allowing for an upgrade from screwdown roofing to standing-seam roofing, and the addition of more insulation without major structural modifications. Recently, many retrofit projects have been undertaken using single-ply, thermoplastic polyolefin (TPO) systems with additional insulation over existing metal roof buildings. 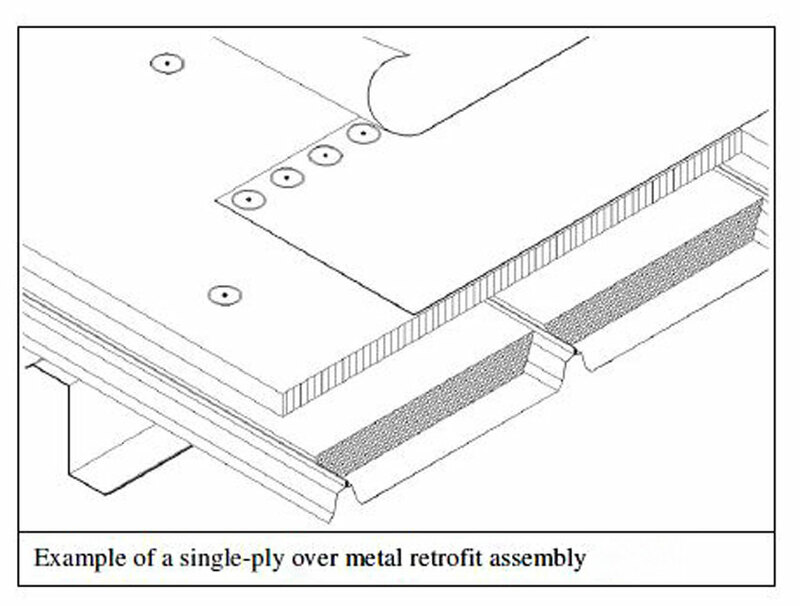 This assembly typically consists of a layer of insulation over the existing metal roof panels and then a layer of single-ply TPO membrane over the insulation. The insulation and membrane are mechanically fastened to the existing roof using metal strips connected to the existing purlins. Once mechanically fastened, the membrane seams are heat-welded together. The systems may be adhered to the insulation and/or existing metal panels. This diagram shows a single-ply TPO membrane installed over a metal retrofit assembly. Both the insulation and membrane are mechanically fastened to the existing roof using metal strips connected to the existing purlins and then the membrane seams are heat welded together. 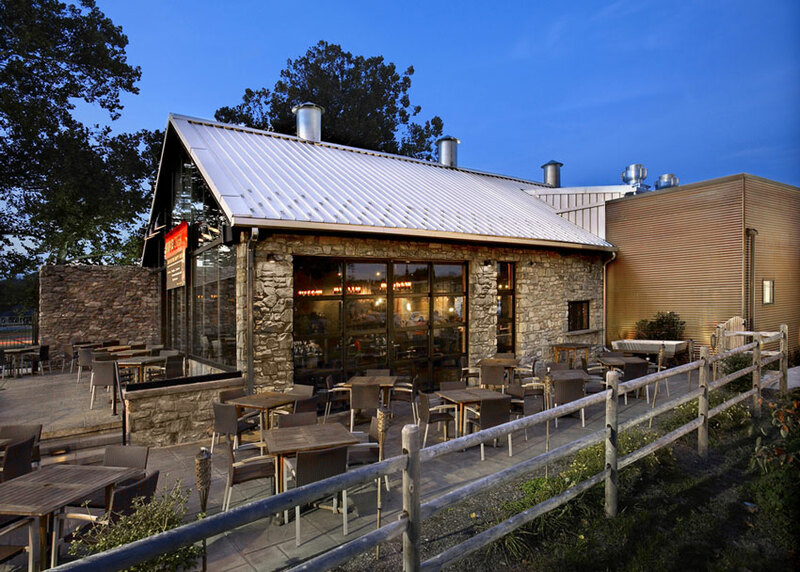 Turning an 18th-century paper mill into the Firecreek Restaurant & Bar in Downingtown, Pennsylvania, a galvalume metal roof was selected to retain some of the building’s original elements. As part of Downingtown, Pennsylvania’s effort to repurpose some of the town’s abandoned mills and reinvigorate the downtown area, a 6,200-square-foot stone building, formerly housing a sawmill and then the Brandywine Paper Mill, is now the new Firecreek Restaurant & Bar. Looking to retain as many of the building’s original elements as possible, Carroll Architects honed in on the roof. In selecting a new 24-gauge galvalume metal roof, the designers were able to blend the contemporary and historic in paying tribute to the original early 1800s metal roof. For example, the roof’s silver color blends in well with the building’s original fieldstone walls and large windows, and the vaulted ceilings are accented by the mill’s original steel roof trusses. In addition to the silver roof, Carroll specified copper corrugated panels for the exterior wall of the establishment’s kitchen—an addition made to the building’s south side. The rust-colored panels serve to break up the redundancy of the fieldstone walls and further transformed the building from a mill into an eclectic restaurant.